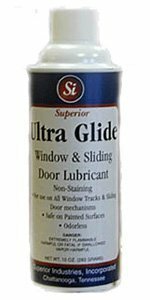 Sliding Door Lubricant: Non Staining:Window Track Lubricant | Superior Industries, Inc.
Lubricate the tracks of sliding windows, doors and panels with Ultra Glide, an oil-free dry spray lubricant that enables windows and doors to glide with ease. Ultra Glide contains microscopic PTFE powder granules that reduce friction while repelling dirt, dust, and grime. Use this dry lubricant on any metal on metal,wood, rubber, plastic, or painted surfaces. Ultra Glide is a chemically inert, non-oily, fast-drying lubricant containing PTFE, an extremely fine polytetrafluoroethylene powder. This dry lubricant demonstrates outstanding microscopic film forming properties, which make it more slippery than silicone or other lubricants like graphite or oil. Use Ultra Glide to cut friction on metal-to-metal, metal-to-rubber, and metal-to-wood moving parts. Ultra Glide’s smooth, greaseless properties are well suited for sliding doors and windows, as the dry lubricant repels dirt and thus prevents buildup of grime and debris. 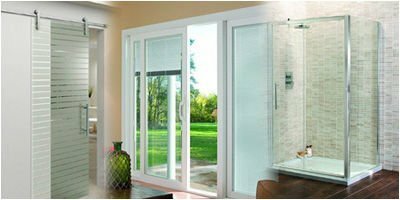 Use Ultra Glide for every door in the house, including sliding glass doors, pocket doors, patio doors, and garage and storage shed doors. Keep track wheels rolling freely and easily for panel systems such as sliding panel walls or room dividers in office buildings, churches, community centers, hotels, and conference centers. 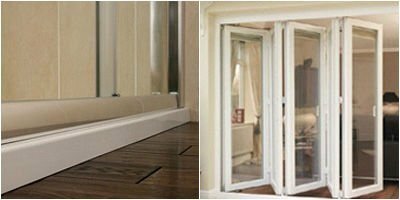 Ultra Glide slides doors easily along tracks for faster and more efficient setup that prevents hang ups and damage to panels and tracks. Avoid tracking problems by simply spraying Ultra Glide—conveniently packaged in aerosol cans— onto window and door tracks. Ultra Glide also comes in handy in other household applications. Because this dry lubricant frees moving parts, it can be applied to locks, hinges, catches, and other household and office fixtures that benefit from lowered friction, anti-corrosion properties, and greaseless lubricant. By minimizing wear and tear and the buildup of resin, Ultra Glide extends the life of tools and equipment. In addition, this dry aerosol lubricant guards tracks and mechanisms against rust and corrosion. As an oil-free lubricant, Ultra Glide repels oil and water, as well as dust and sand, to keep track surfaces clean and dry while in use. Spray Ultra Glide with confidence-it dries quickly, has no odor, and does not contain chlorinated solvents. Ultra Glide is packaged in aerosol cans (10 ounces net weight) in cases of 2, 6, 12 or twenty-four. The aerosol cans spray a circular mist for easy application at any angle. As a dry, non-conductive lubricant, Ultra Glide dries within seconds of application for a clean, clear finish that will not stain or discolor wood or painted surfaces. This lubricant is also stable at high temperatures (up to 500oF) for a versatile, slippery product that can handle high-heat industrial environments as well as household applications. Ease the way for your windows and doors-whether at home or in every room of your office or workplace-with Ultra Glide, a dry oil-free lubricant designed to reduce friction and prolong the life of your windows and other sliding mechanisms.